Hitomi Ashta - born in Japan, lives in India. Performing Shorinji Kempo…Defend first, attack later. As a young girl growing up in Nagoya in Japan, Hitomi Ashta’s simple ambition was to become a school teacher in her native city. But little did she know what the twists and turns fate had in store for her. Today, the 38-year-old mother of three is an accomplished instructor of Shorinji Kempo--one of the most popular martial arts of Japan - and practices it at her Panchsheel residence in south Delhi. Two questions immediately come to mind. How did a traditional Japanese lady make India her home and how did this lady who wanted to be a school teacher become a master of the tough art of Shorinji Kempo? The answer to the first one is simple - Hitomi married an Indian, Ashok Ashta, whom she met in Japan. But the answer to the second question is more fascinating. Born and brought up in Nagoya, a town between Osaka and Tokyo, Hatomi aspired to be a school teacher. She knew that the job was not without peril. Japanese students have a reputation of being hostile to their teachers and their behaviour can border on aggression. 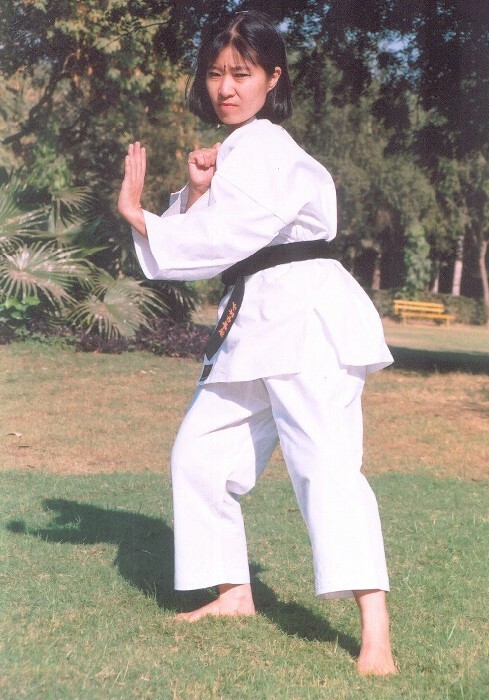 To protect herself from any untoward incident she decided to train in Shorinji, the martial art that teaches courage and self-defence skills. "That was the only way to earn the students’ respect and it would also make me confident of facing the class." She was so committed to mastering the art that she got a black belt within a year - a near impossibility in Shorinji Kempo. She says, "You don’t get a black belt in a year’s time, but I had worked very hard and my instructor was very impressed. He decided to bend the rules for me as I had learnt practically everything." But destiny had other plans for her. While learning English from a private institution, she met a young Indian who had come there to teach English. Ashok Ashta was in Nagoya University as part of a fellowship exchange programme from Williams College, Massachusetts, where he was doing his graduation in liberal arts. The teacher-student relationship soon blossomed into romance. Ashok had to go back to Massachusetts to complete his degree, but he came back to Japan where he started working for Toyota Motors. Soon afterwards, the two got married and eight years later, when he wanted to come back to India, Hitomi accompanied him. Now it has been six years since she settled in Delhi and is one of the only practitioner of Shorinji Kempo---apart from her disciples. No, she does not run a school. "I’d love to but with three children I have my hands more than full. Besides, Shorinji principles dictate that you practise with a partner and I don’t have one". What about her husband? "Oh, he is very tall and I am very short," she laughs referring to almost twelve inches that separate them. What exactly is Shorinji Kempo and how is it different from other martial arts? This unusual technique originated in the late forties. The story goes like this….After Japan’s defeat in the Second World War, the founder of the art, Shike Doshin came back to his country from China where he was studying Chinese philosophy. But the suffering and humiliation the Japanese had suffered in the war made him both sad and angry. He started to believe that the root cause of all the suffering was the lack of character in people. The only way to make the world a peaceful place was to develop strong character among individuals to make them into better human beings. So on the basis of the art that he studied in China called Ken – originally a martial art and training method in the teachings of Buddha - he developed Shorinji Kempo. "It is not designed for fighting but teaches you self-control, physical and mental balance and growth," explains Hitomi. In fact, the three main goals are self-defence, spiritual development and better health. Doshin began training young people in Japan. The trickle soon became a rush as the virtues of the new art started to spread. Over half a century later, today there are 3,000 branches of Shorinji in over 100 countries. If you want to learn Shorinji, advises Hitomi, you must start by examining your inner self. "Separate your good and bad points. Then correct your bad points," she says. The art also lays emphasis on respect for others, cleanliness in dress and environment and above all a positive attitude. Adds Hitomi, "It’s a combat mode with a difference. Shorinji Kempo doesn’t teach violence. It teaches to shun violence. But it also teaches self-defence, patience, compassion and tolerance in a way no other martial art does. That’s why they say….Beware the anger of a peaceful man!" Copyright © 2000 - 2007 [the-south-asian.com]. Intellectual Property. All rights reserved.